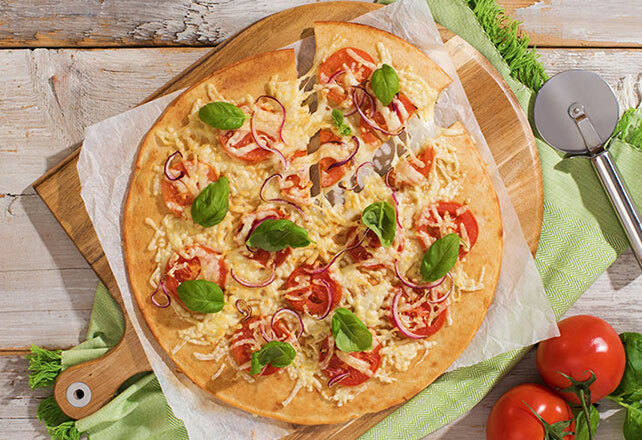 Enjoy a slice of this delicious Pizza Margherita. Topped with garlic, plum tomatoes and mozzarella, this Pizza Margherita is impossible not to love! Reserve 1/2 cup mozzarella; sprinkle remaining onto pizza crust. Top with all remaining ingredients; sprinkle with reserved mozzarella. Place crust directly on middle oven rack. Bake 10 to 12 min. or until cheese is melted. Substitute drained roasted red pepper slices for the tomatoes.